The November full Moon is super-sized! 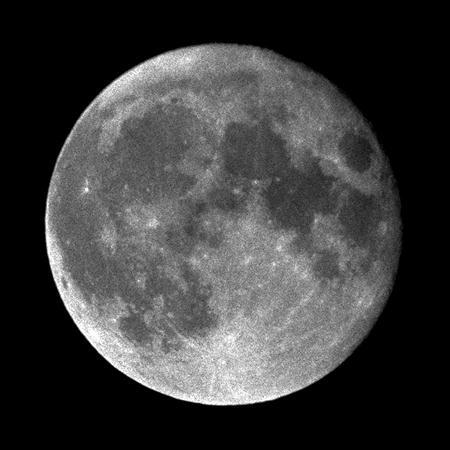 Of course the Moon is not actually changing size: it only appears about 14 percent larger (and 30 percent brighter) because it is closer to Earth. Though the Moon passes this close (called perigee) every month, it doesn’t usually happen when the Moon is full. This alignment won’t happen again until 2034. While viewing the super Moon, notice that the “eyes” of the “man in the Moon” are black. Was the Moon in a fight at school? No, but it did get pretty banged up in its youth. This month’s science snack is about the science behind those black eyes. The best time for Americans to see the super Moon is Monday morning (Nov. 14) about two hours before sunrise. If you’re not up that early, look east on Sunday or Monday night just after sunset. Connect the six dots of the Apollo landing sites to make a letter “N” for nose using my Animated Moon Map. Image from Inconstant Moon, John Walker, May 1997. Cooks know that heavier items in soups sink to the bottom of the pan, while bubbles of gas rise and escape as steam. This separation also occurs when planets form. Thus iron, which is the heaviest of the top five most abundant elements (oxygen, silicon, aluminum, iron, calcium) on Earth, sunk to the hot core. Lightweight oxygen and silicon rose to the surface, combined into silicate rocks and formed a crust as Earth cooled. Then along came the big bad Giant (impact) that formed the Moon. A bully a third to half the size of the juvenile Earth, struck Earth off center and left the world spinning. The Earth gobbled up most of giant, but spit a huge gob of molten mantle into space, forming a ring around the planet. About half the ring fell back to Earth and the rest (minus the water and gases that steamed away) collected into a ball that became the Moon. The iron in the infant Moon sunk toward its core. Lightweight elements floated to the surface and cooled. Oxygen combined with silicon, aluminum, potassium, calcium, and sodium formed into silicate minerals such as quartz and feldspar that are basically white like beach sand. So the baby Moon had a smooth white face. But the early solar system was a tough neighborhood. There was a lot of rock throwing going on. The Moon got pounded. The left (Sea of Rains) and right (Sea of Serenity) “eyes” were two of the biggest hits. An even bigger bruise on the far side (South Pole Aitkin Basin) raised rings of mountains higher than Mt. Everest. These impacts left deep craters and created shallow places in the crust. As the Moon’s gravity pulled it into a smaller ball, it wrinkled and cracked. Pressure pushed hot lava up through these cracks to spew onto the surface between 4.2 and 1.2 billion years ago. This lava had the consistency of motor oil. It flowed on top of the white “skin” and pooled in the low places formed by the impacts. Because the lava was from the “bottom of the pan,” it contained iron which is black. These black pools of lava cooled and became the seas that make the “eyes” and other dark areas of the Moon. The Moon continued to be pummeled. Effects of unfiltered sunlight and impacts that kicked up dark dust turned all the white areas to gray. Some impacts punched through the layer of black lava to the original white surface underneath, shooting white rays across the surface. An example is Copernicus, a white-rayed crater below the Moon’s left eye (it makes a triangle with the Apollo 12 and 14 landing sites). Tycho’s rays are harder to see because they are white on gray. They show up best during a full Moon—especially a Super Moon! All the mountains on the Moon are rounded like Mt. Hadley (from Apollo 15) because they are buried under fallout kicked up by eons of impacts. Astronauts reported the upper layer of dust was as fine as flour and slippery enough to ski on. NASA image. So the “eyes” of the Moon are black because they contain a lot of iron. The highlands are light because they contain a lot of feldspar, which is basically white. The blackest of the Apollo landing sites is Apollo 15’s between the “eyes.” Rocks collected there averaged almost 20 percent iron. 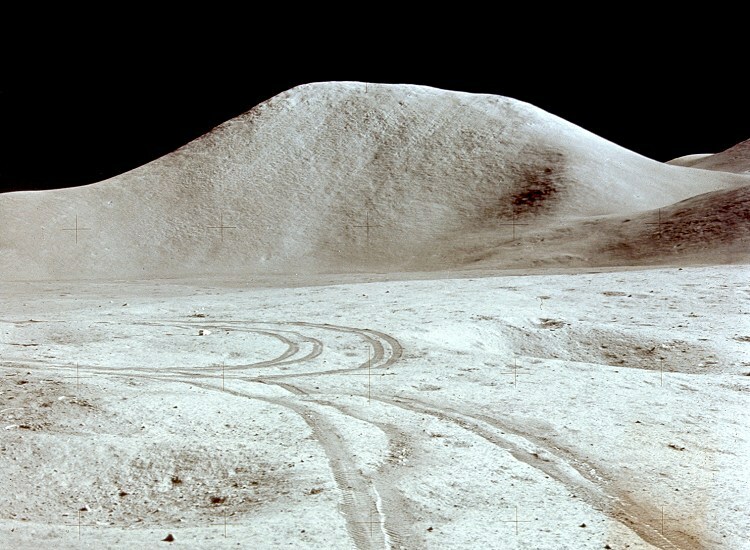 The whitest landing site is Apollo 16’s in the highlands. Rocks collected there averaged only 5 percent iron. [Reference permanent.com] But under the of dust at Apollo 17’s site, Harrison Schmitt found the remains of a fire fountain that produced colored beads coated with rare volcanic gases. And they were orange. I call that pretty darn super! To learn more about the Moon’s formation and how future lunar pioneers can use its resources to live and work there, please get your kids a copy of my book, Home on the Moon: Living on a Space Frontier, published by National Geographic and winner of the American Institute of Physics Science Writing Award. Watch my website Contact Page for appearance updates & Twitter for photos. 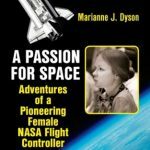 Monday, November 14, 2016, 4-5:30 PM Central Time live (and archived for listening any time after), interview on The Space Show with Dr. David Livingston to discuss the 35th anniversary of STS-2’s landing, experiences as one of the first female flight controllers, and current efforts to encourage young people to consider STEM careers. January 13-14, 2017, speaking at the Conference for Undergraduate Women in Physics (CUWiP) at Rice University.